"We are hearing things from patients treated with the ALLEGRETTO that we are not accustomed to hear. They are returning on the day after surgery, saying that their vision is better than they ever had with glasses or contact lenses." "I have repeatedly said for the past three years that the ALLEGRETTO is the best laser on the planet because it was built from the ground up using wavefront principles, not retrofitted. The wide range of FDA approvals speak for themselves. The speed and precision of the tracker are awesome." "ALLEGRETTO WAVE patients have been thrilled with their results. This high repetition rate, flying spot, tracking laser uses everything learned from custom studies to incorporate wavefront optimized ablation patterns to minimize induced spherical aberration to very low levels. A lot of fun to use this high tech laser." 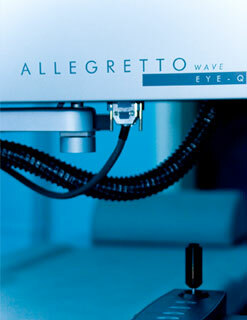 "The ALLEGRETTO WAVE is the best refractive laser available today anywhere in the world, in my opinion. 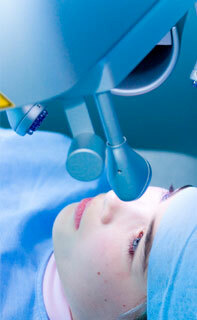 Visual results and patient satisfaction are unsurpassed, as proven by the data submitted to the FDA." "The ALLEGRETTO WAVE produces excellent results across offering these quality results to patients in my New York practice as well." "I have been working with Excimer lasers since 1990 and I have used most of the available lasers including the most sophisticated flying spot lasers. I now use ONLY the ALLEGRETTO and have been very satisfied with its performance and results." "As the first ALLEGRETTO user in South America , we are very pleased with the support we received from Lumenis and the local distributor to install and maintain our laser. We are extremely happy with the surgical results we are obtaining with the ALLEGRETTO WAVE Laser as well the Wavefront and Topolyzer. Our surgical volume has triplicate in the past one and half years, and we became a reference for refractive surgery in our area." "I have been using the ALLEGRETTO WAVE since March 2001 and have been delighted with the wider range of treatments with better results that I have been able to perform. Having wavefront data in my standard program has given me a definite competitive edge over my fellow refractive surgeons." "The ALLEGRETTO WAVE has become a reliable "best buddy" to me since I first started using it. It´s like driving one of these incredibly reliable German cars like Porsche or Mercedes, which are built by dedicated and caring engineers. The ALLEGRETTO has the same origin." FDA approves new applications for the ALLEGRETTO product range. Erlangen, March 9, 2005. 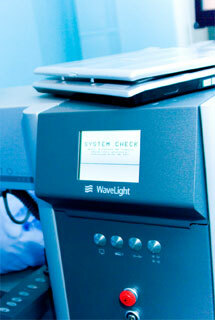 WaveLight AG continued its growth path in the first six months of fiscal year 2004/2005. The Company reported revenues of €34,373 thousand, an improvement of 22 percent year-on-year (prior year: €28,113 thousand). Earnings before interest and taxes (EBIT) also improved as against the prior-year figure (€2,370 thousand), totaling €2,424 thousand. Sterling, VA, October 25, 2004. WaveLight, Inc. today announced that during the last 12 months, its ALLEGRETTO WAVETM laser attained 20 percent share of all new refractive laser sales in the U.S., according to Market Scope, an independent market research company. Deutsche Börse AG’s Prime Standard, has announced its revenues forecast for fiscal year 2004/2005. The Executive Committee of the Erlangen-based laser producers expects revenues of €78 million for fiscal 2004/2005, which began on August 1, 2004.